A Flash Flood Warning has been issued for Putnam County, New York: Flash flood watch remains in effect from 2 AM Saturday through Saturday afternoon. The flash flood watch continues for portions of Southern Connecticut, Northeast New Jersey, and Southeast New York A slow moving frontal system will approach the region tonight into Saturday. Less than 15% of U.S. college-bound high school seniors achieve perfect SAT scores. 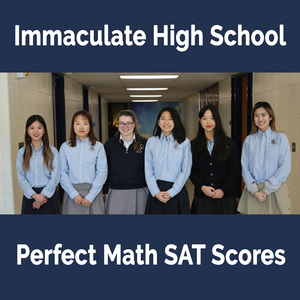 This year, six Immaculate High School seniors achieved perfect scores on their SAT math section, with two of those students achieving a perfect score on the Level II SAT math test and one achieving a perfect ACT composite score. Sarah Bohling of Brookfield, Yuxuan Brittany Hu of Ridgefield, Wenqi Angela Lai of Brewster, Qianer Kris Lu of Ridgefield, Zhiwei Catherine Wang of Ridgefield and Mozhu Cindy Zhao of Bethel had a perfect score of 800 on the math portion of their SAT. Yuxuan Brittany Hu and Wenqi Angela Lai also earned perfect scores (800) on the Math Level II SAT Subject Test, an advanced version of the regular SAT math portion. To succeed in the test, a student needs four years of math which must include precalculus and trigonometry. Sarah Bohling also earned a perfect composite score on her ACTs, achieving the full 36 points one can average of the four subject area scores—English, Reading, Math and Science. Immaculate High School, ranked by Niche as a top ten best private college-prep high school in Fairfield County, has the highest student SAT scores of the Diocese of Bridgeport schools. Based on a four-year study of student college recognitions, Immaculate High School reports a return on tuition investment that yields three times the investment when attending Immaculate High School. Most recently, 90% of the Class of 2018 were awarded college scholarships and grants totaling $20 million and 100% of the students are attending highly respected colleges and universities, with 95% of them being accepted to their first or second choice colleges and universities. The top 10% of students achieved an average 1309 SAT score and nearly 75% of the class earned a GPA of 3.5 or higher. compassion and reverence for others. Community service is also stressed; in 2018 students performed 27,794 hours of community service. In the 2019-20 school year, Immaculate will be offering additional business courses as well as a Certified Nursing Associate program.